The Sony Z Ultra Google Play Edition was a pleasant surprise when it was unleashed on the world a week ago. Its release was totally unexpected. Unfortunately, it also came with a few issues. A couple of pretty big bugs were uncovered shortly after release, which we covered yesterday. The first bug prevented users from accessing the Security menu, which is a pretty big issue on what was supposed to be an open developer-edition type phone. The second bug was even bigger because it prevented users from uninstalling applications. Any application that was installed was stuck on the device. If you tried to uninstall an app, the UI would reset itself and send you back to the home screen. Thankfully, a fix is rolling out to the device right now. 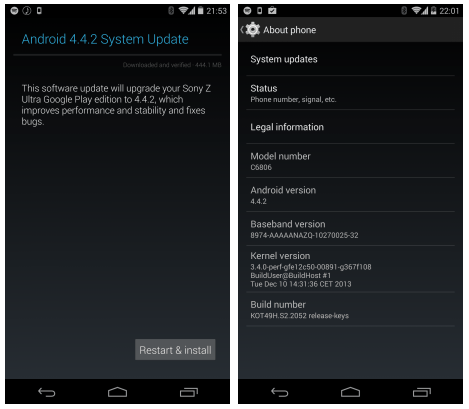 The Sony Xperia Z Ultra GPe is getting an update to Android 4.4.2 now. The OTA update is rolling out to the users, and it will fix both of the bugs that are plaguing the handset. Android 4.4.2 KitKat is not a big update in and of itself, but the fact that it squashes these two bugs is a big sigh of relief for device owners. Google was really quick to push the update out, too. Xperia Z Ultra GPe owners will now be able to access the Security menu to enable app side loading, among other things. They will also be able to uninstall apps like normal. It’s the basic functionality that matters most, right? The Xperia Z Ultra Google Play Edition has been available on the Google Play for a week. It’s the exact same, giant Sony Xperia Z Ultra that we are already familiar with. As a GPe device it runs stock Android, clean and clear of Sony’s UI overlay. One of the major benefits of a GPe smartphone or tablet is quick access to updates from Google. In this case, Google was able to fix two major bugs by pushing out an update for the device, bringing it up to the latest version of Android. Updates for GPe devices aren’t always this quick, but Google had reason to move fast with to get these bugs squashed. The post Android 4.4.2 Rolling Out To The Xperia Z Ultra GPe With Bug Fixes In Tow appeared first on AndroidHeadlines.com |.